Serial over Ethernet software allows you to share COM ports over the network and connect to remote serial devices like they were attached directly to your local computer. The program is designed to create virtual copies of real serial ports on remote PCs. 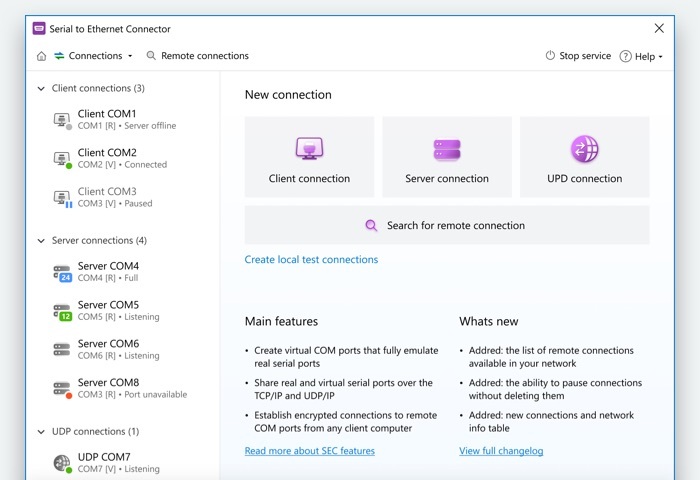 If your computer lacks a serial port or you need additional COM interfaces for communicating with all of your COM-based devices, Serial to Ethernet software will let you create as many virtual serial ports as you need. Serial over LAN Connector makes it simple to access remote RS232/RS422/RS485 ports wirelessly across a local network or the Internet. By creating a server connection, you share a local COM port over LAN in such a way that it becomes available for access from multiple remote client computers. If there is not an actual serial interface in your server system, you can create a virtual serial port that will fully emulate the configuration and settings of a real COM port. By establishing a client connection, you initiate data exchange between a real or virtual serial port of your client computer and a COM port shared on the server machine. To enable serial data transmission over a TCP/IP channel, you just need to specify the IP address of the remote host and a TCP port to connect to. Serial to Ethernet software provides the ability to select UDP/IP as a transport protocol for your network communications. In this way, attached serial port devices can send communication data over a local network. With RS232 over Ethernet app, you get a bunch of additional options that significantly widen your serial over IP sharing capabilities. When you need to send serial data as it is, without applying any protocol-specific formatting at the application layer, you can select the RAW data transmission option in the software settings. Connected over the Telnet protocol (RFC 2217), a serial server and client can exchange their local port configurations. Every time you alter your COM port settings, the information on the changes is sent to the remote end. Running as a Windows service, Serial over Network Connector maintains all of your network connections even when its interface is closed. Both the incoming and outgoing connections are re-configured upon the system boot automatically. The software allows you to control the way serial data is transported over the network. You can pause sending the network packets, accumulate data in a buffer for a certain amount of time, etc. Whether you're looking at redistributing our Serial port redirection engine as a part of your product or considering Serial to Ethernet Connector software for an enterprise-wide deployment, we offer flexible and affordable corporate solutions designed to meet your needs. In our quality control laboratory, we use specialized instruments which communicate with computers via serial ports. To avoid constant relocation and re-calibration of the equipment, we decided to try sharing the devices over LAN. Serial to Ethernet Connector helped us do this easily. Now, if somebody needs to connect to a particular device, they can share serial over Ethernet and access it remotely via a terminal server. The COM port sharing capabilities of Serial to Ethernet Connector has become an integral part of our diagnostic software for oil rig machines. After our engineers implemented the remote access functionality in our automation system, the service personnel can detect issues, affecting the system’s state, significantly faster and more efficiently. I was looking for a way to pass through a TAPI device to a client Citrix XenDesktop session. Since it didn’t seem possible to map it to a client COM port in XenDesktop, I chose to go with a third-party solution. Serial to Ethernet Connector allowed me to forward my TAPI device across Ethernet to my virtual machine. Serial to Ethernet Connector meets all of our key requirements. It’s reliable and offers password authentication and traffic encryption. These options are especially important to us, as we work with the point of sale terminals and need to keep our data protected. This app has made it super easy to access POS hardware via virtual serial ports shared over Ethernet. Submit your email address to get a link for quick download on your desktop and get started! The download link was sent to you, check your email. Copyright © 2019 Electronic Team, Inc. and its affiliates and licensors. All rights are expressly reserved. The software programs and accompanying documentation are the copyrighted property of their respective owners and protected by copyright laws and international intellectual property treaties. Serial to Ethernet Connector ® and all related product and service names, design marks and slogans are the trademarks and/or registered trademarks of Electronic Team, Inc. and its affiliates and/or its licensors. All other product and service marks contained herein are the trademarks of their respective owners. Any use of Electronic Team, Inc.’s and/or its affiliates’ or third parties’ trademarks or logos without the prior written consent of their respective owners is strictly prohibited.